The Man Who Predicted Google Glass Forecasts The Near Future : All Tech Considered More than 20 years ago, science fiction writer David Brin wrote about "Tru-Vu" goggles, used to surveil and record. It's not unlike Google Glass, which is available to testers today. Brin offers his predictions about how this technology will play out in the next decade. "Right now, Google Glass might be the world's worst spy camera; if you go out in public with a pair on, you are guaranteed to attract attention. Still, the idea of techies mounting a tiny screen and a little camera to their faces makes millions of people uncomfortable. According to Sarah Rotman Epps, a tech analyst at Forrester Research, that is why Google is rolling out Glass to the world slowly in stages.
" 'Google has been incredibly transparent ... with their Glass rollout,' Epps says. They realize that Google Glass will require shifting social norms to be accepted." Glass technology may be relatively new to us, but wearable lenses that overlay data and record video is a decades-old idea in the minds of science fiction writers. In physicist and author David Brin's 1990 novel, Earth, characters wore "True-Vu goggles" to surveil and record "youngsters." And the way society has reacted to wearable technology is what Brin wrote about in his 1998 book, The Transparent Society: Will Technology Force Us to Choose Between Privacy and Freedom? It went on to win the American Library Association's Freedom of Speech Award. 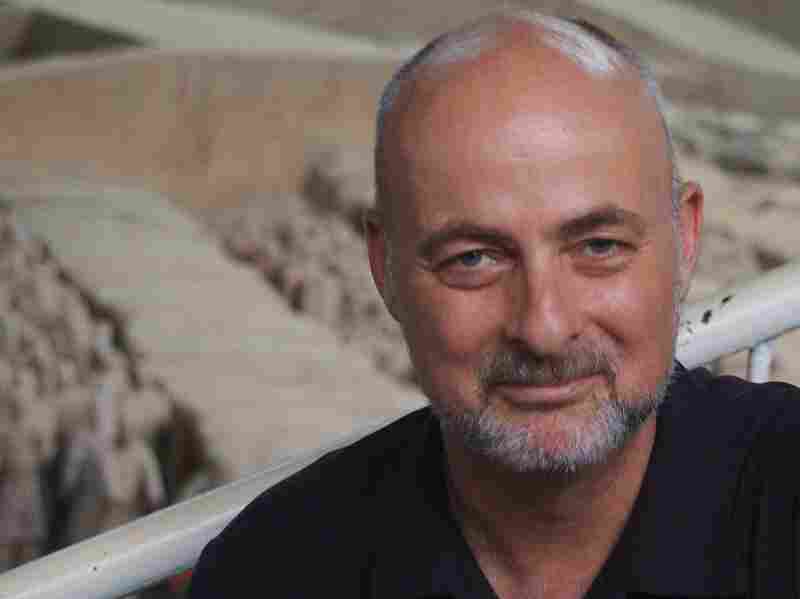 Physicist and writer David Brin, in Xian, China. Like every other generation, "grouches" will fear this new technology. "Every time this [technological change] happens, grouches proclaimed that humans were never meant to do this, that we never evolved to or weren't created to handle that kind of information flow. They were always right in the short term. The transcendentalists who would claim this would make us bigger, better and wiser were always wrong in the short term." Augmented reality will likely lead to casualties. Mainly because distracted drivers will get into accidents or distracted lens wearers could walk off curbs or into moving vehicles. As Brin says, "Duh." Most of us will become easily identifiable to one another. Brin imagines a society in which Google Glass and similar devices are available to all of us, which then help identify us, as well. So you could potentially put on your glasses, walk down the street, and everyone would have "electronic name tags" on, along with background data about one another. "You'd never be at a loss," says Brin. We won't need wallets anymore. Wallets are full of "objects for reputation," says Brin. Items like your identification, or credit cards, will become unnecessary in a world where you wear your data, and that means you enter into situations already knowing one another's reputations. Handshake deals will come back in a big way. Since everything could potentially be recorded, you could make a handshake deal "like in the village of old," says Brin. If your business partner's specs record the deal and yours do, too, that's two copies of the same transaction. Governments will be tempted to legislate Glass and similar technologies, but regulation can't keep up with technology. "What's going to happen in the next 10 years is disruptions and disappointments that will cause people to be tempted to legislate against these things," Brin says. "The first impulse has to do with privacy." But, he says, regulation will never keep up with the speed of technological innovation, so by the time Google Glass gets regulated, Glass-type technology will be built into contact lenses, or into even more conspicuous devices. So Brin says if wearable technology will allow for some segment of society, say, government, to "spy," then all of us should want and have the same technology available. Society, he says, should refrain from bans on Glass and similar technology so that everyone has a way to peer at everyone else, making the background knowledge we have of one another the normal rules of human engagement. Brin wrote in 1988, "The world had a choice. Let governments control surveillance tech ... and therefore give a snooping monopoly to the rich and powerful ... or let everybody have it. Let everyone snoop on everyone else, including snooping the government!" So, what do you think about Brin's predictions and positions? We got some great feedback from y'all on Monday about Google Glass catching its first arrest. Leave us a note in the comments or via Twitter, and I'll save them for a future post.